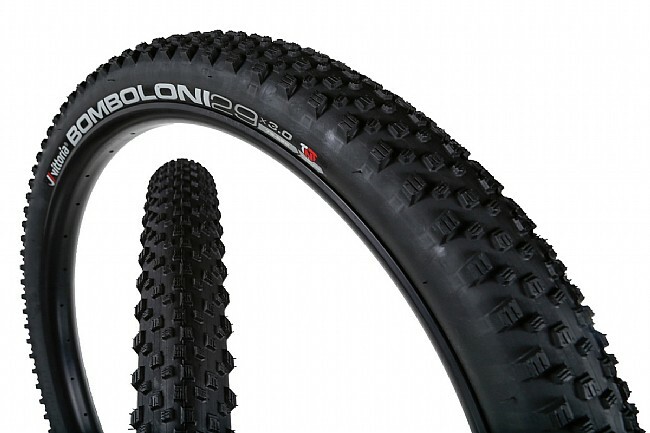 Bomboloni are Italian doughnuts, and whether or not you're able to skid in circles on your fat bike, these tires will at least bring a smile to your face as if you could. Its low-profile tread takes cues for Vittoria's automotive division, employing alternating sipe angles on the square ramped blocks for digging into hardpack and providing traction on slippery surfaces. The well-spaced and evenly-distributed knobs give the Bomboloni predictable and consistent performance in any season and on any terrain, even snow. Features dual-compound rubber on a TNT tubeless-ready 120 TPI casing. 29” x 3.0”. Claimed weight is 1040 g.
Excellent Doughnut! Great grippy roller! These tires are great addition to any 29er frame that can handle them, they are on my e-bike and are awesome for all these Alaskan conditions. Perfect for most any terrain and roll fast and true. These tires are great, I have ridden them this fall and am looking forward to trying them this winter. The roll fast and are very grippy in all the right places. Very confident feel off road and track where pointed. I am very happy with performance.